Both the 11-inch and 12.9-inch 2018 iPad Pro models are well-constructed slabs that ooze computing performance and fetch a new design that eliminates the home button, replacing it with Face ID. However, just because the tablets are made out of aluminum doesn’t mean that they will have a solid construction in place. The majority of the times, the internal structure needs to have cleverly placed screws that will give the product an extra layer of durability. In the latest test, the 11-inch iPad Pro does not make it out at the end, and here’s why. 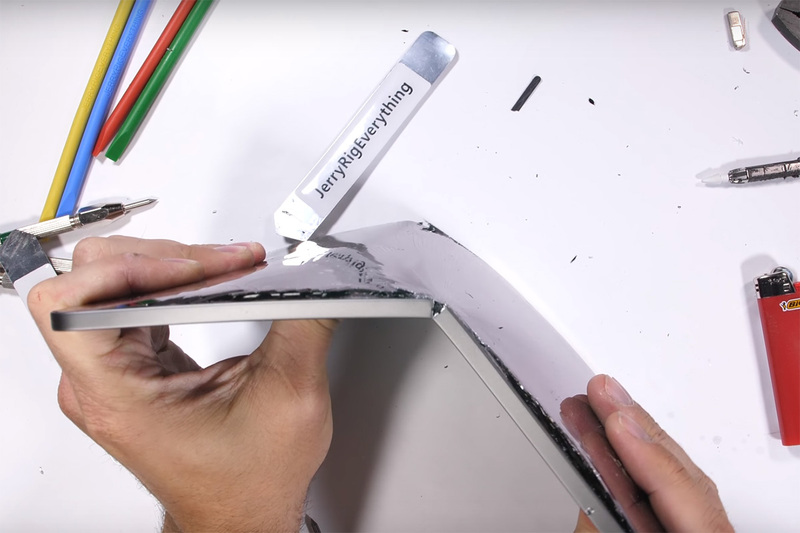 Zach from JerryRigEverything has developed quite a reputation on YouTube for carrying out durability tests on mobile phones. However, we don’t think that we’ve seen such a test getting carried out on a tablet before. However, since the iPad Pro belongs to Apple, the content creator believes it should have a place on the YouTube channel. He praises the build of the tablet and carries out a series of torture tests to see if the manufacturer skimped out when it came to using the best possible materials. So far, everything had checked out till the point Zach used a lighter to burn the Liquid Retina display of the iPad Pro. Since it is an LCD screen, the pixels recovered in a short period of time. However, the part where the tablet did not recover from was the bend test. In fact, the slate snapped quite easily, indicating that you should not apply a significant amount of force on the tablet, such as accidentally sitting on it. After examining the damage, it was found that the crack took place right where the microphone hole is present and where the wireless charging dock is placed for the new and improved Apple Pencil. The thin glass screen did not help with increasing the durability either, and the batteries were not properly compartmentalized to give the slate extra rigidity. Under normal scenarios, the 11-inch iPad Pro will certainly hold its own, but you’ll have to be careful when carrying it around. If you want to check out the durability test, the video has been given below. If you want to learn anything new about the iPad Pro, you can check out our previous coverage of the tablet below.